While I was at the ISTE Conference last month I attended a presentation on flipped learning by Jon Bergmann and Aaron Sams. The essential question that was being addressed was what is the best use of face-to-face class time? 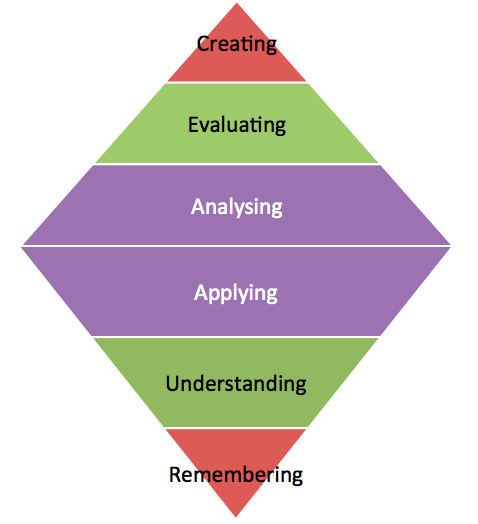 Bloom's Taxonomy has often been seen as a pyramid, with the higher level thinking skills on the top - and that this equates to the amount of time spent on thinking in the traditional classroom, with a lot of remembering and understanding and very little analysis, evaluation and creating, which may be assigned for homework. 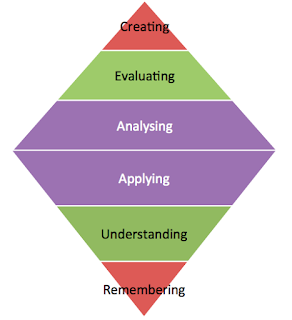 Some people have suggested that with the flipped classroom, the pyramid should be flipped so that the time spent at home is on learning the content (remembering and understanding) and the majority of class time is spent, not on the bottom two tiers of Bloom's, but on applying, evaluating and creating. Jon and Aaron don't agree - they said this is more the model for doing a PhD, rather than what you would expect to see in a flipped classroom. They suggest that the best model for class time in a flipped learning model should be more like a diamond, with most of what goes on in class being in the middle levels of Bloom's Taxonomy. They addressed critics that flipped learning can't happen in (American) schools because of the inequitable access to technology in students' homes. They pointed out that in fact 95% of American kids do have access to the internet at home, and that for the small number who do not it should be possible for teachers to come up with interventions to find ways around this. In answer to critics that some students won't do the content learning at home, they suggest having exciting things to do in school for the students who have watched the videos. The ones who haven't watched them will have to spend the class time catching up instead of engaging in the more exciting learning engagements in class. Jon and Aaron believe very much in face to face human interaction between students and teachers - they want to reclaim the majority of class time back for this. John Bergmann spoke with real honesty about how the world is changing from a time when he first started teaching when the knowledge was either in the head of the teacher or in a book in the library. He explained that he did "the lecture thing" for 19 years before deciding to do something different - and that for those 19 years he would have rated himself as a very good teacher who gave quality instruction in class. However he talked about the fact that we are now in the middle of a transition as students are now going online to learn. In particular he talked about how even elementary students are learning how to do things on YouTube, where they can rewind to check to see if they are doing something correctly. Aaron Sams referred to this as being the "default setting" for students. 6% of class time is spent on cognitively complex tasks involving generating and testing hypotheses. Clearly not much has changed since the term "sage on the stage -v- guide on the side" was coined over 30 years ago! Aaron and Jon challenged us to "change the 58%" through considering using a flipped learning approach. Activities - Jon and Aaron talked about how it is a mistake to try to do "cool activities" every day as there needs to be time for teachers to walk around and help students. They suggest a good balance is 75% of time spent on processing and 25% of time spent on activities. Mastery organization - students have to master something before they move on. In these classrooms there must be objectives with benchmarks that students master before they move on. Flipping instructions so students watch how to do something at home before coming in to do it in class (application). They suggested making "Here's how to ...." short videos. Recording others' experiments using devices in school (application) as students record and make their own videos. It's also possible to record students explaining what is happening and students can then watch each others' videos. Simulations (application and analysis) followed by a video to supplement learning. Rethinking the timing of homework checks. They talked about how before flipping they spent the first 15 minutes of each class going over homework, then 20 minutes teaching new content, then 10 minutes of practice. Now the sequence is to first spend 10 minutes discussing the homework video, around 30 minutes practicing new content, and around 5 minutes going over this classwork. Flipping the writing workshop to one on one by making a audio file for students to listen to in class with teacher comments. This involves analysis and evaluation. Students can listen to the audio files at home and then make their revisions in class. Apparently this takes no more time than one on one conferences in class and has the advantage of freeing up the teacher to help with the editing in class. Choice days and activity days (applying, analysing, evaluating) with learning choice paths where students can choose to view the teacher created video, read a book or access the content on iTunes U, followed by them choosing to create a poster, write a news story etc to show their understanding. Other teachers have used more of an inquiry approach so students first explore, then watch a flipped video, then apply. This means they develop their own conceptual understanding through exploration and then look at the flipped videos to consolidate this in the middle of the learning cycle. Stages - where students learn how to perform a task using a flipped video, then in class they execute the task and collect the data. Then they analyse the data and construct formula or functions that explain the data. The "In-Flip" where the video is a station within the class. This can be popular in elementary classrooms where half the class can watch a video while the other half work with the teacher. Using the flipped video to get students excited about something - for example video story problems. Pose the question on the video to have students think about at home, and then have them solve the problem in class. Student created content - students can create their own videos in class that can be used with the following year's students. 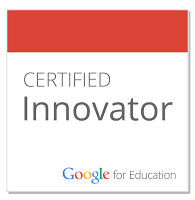 The idea behind this is that you really need to know something to be able to teach it to others. Do you have other examples of how class time can be better used in the flipped learning model? If so leave a comment below to share these ideas. If you would like to read books about flipped learning they can be found here.